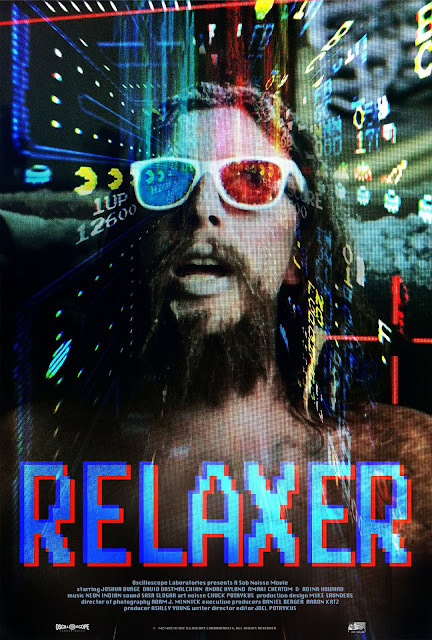 If you take Ven diagram of David Lynch and Kevin Smith, then divide the result by Castaway, you get an idea of what Joel Potrykus has done with his latest effort, RELAXER. Abbie (Joshua Burge) is an impossibly sedentary 90s slacker dedicated to concurring Pac Man without leaving the couch. Set in the days and months leading up to Y2K, RELAXER presents a slightly augmented version of history through the eyes of its singularly motivated protagonist. For a film set in one room and primarily focused on a single character, RELAXER moves through an impressive number of tones and visual styles. One of the biggest challenges with limited storytelling is in the cinematography. Potrykus manages to keep the film interesting from that perspective by shifting through distinct techniques for each of the film's 3 acts. At times warm and inviting, at others disgusting and uninhabitable, the apartment at the center of the film goes through its own character arc mirroring the slow decay of Abbie's psyche. Slightly uneven performances could turn off some viewers but I found the whole thing utterly compelling. There are moments where the camera hangs on Burges' face and he has the ability to command the audience's attention. You are witnessing a man unravel without dialogue or optical trickery, its all in Burge's understated performance. RELAXER has a voyeuristic approach that can be painful to witness. As an audience, we want to look away, but the mixture of body horror, comedy, and psychological deterioration is an effective and gripping cocktail. For oddballs like me who are always seeking out something different and new RELAXER is a completely satisfying experience. Oscilloscope Laboratories has been consistently turning out odd little gems over the last 5 years, NOVEMBER, THE LOVE WITCH, and LOST IN PARIS all come to mind as interesting if not perfect films that beg for multiple viewings. They've become akin to an indie record label in the 90's. Much like Dischord House, SST, or Jade Tree, I'll give anything they put out a shot. While I might not always love the films I'm almost guaranteed to see something I haven't seen before. RELAXER is a peculiar film that I want to hang on to and recommend to only a select few. It will without question be unwatchable for some but for others, it could be their favorite of 2018. At the very least it has been one of the highlights of this year's FANTASIA and a film I look forward to revisiting in the near future.